It has been colder in April than it was in December. I have had it with winter and if the weather will not cooperate, then my cookbook selections will!! 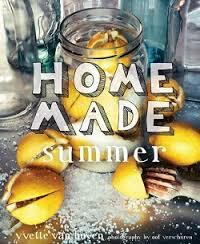 Home Made Summer by Yvette van Boven is the eagerly anticipated companion to her book Home Made Winter, which followed the ever popular Home Made. All of van Boven's books have that "nextdoorneighbor" feel to them and perhaps that is why they are so popular. She makes you feel that you can do exactly what she does. And, of course, you want to divide your time between Paris and Amsterdam, cooking and working with your husband, the photographer. My problem with this book is from a publisher's standpoint. They perused the photos looking for a bright and sunny summer photo that was generic enough to say summer without linking the book to a particular genre. But really, every third cookbook published has a "recipe" for preserved lemons. Salt lemons ant throw them in a jar! Really? Am I wrong? Well, I just got in a new "grilling" cookbook and checked the index -- sure enough a "recipe" for preserved lemon. Again, lemons, salt, jar. I am complaining about this because there are great recipes that you probably never thought of that would have been a much better showcase for this book. Like this one. 1. Put everything in a blender and blend until completely smooth. Pour through a sieve into a bowl with a spout and then pour into 4 to 6 ice pop molds. 2. Place in the freezer and push wooden sticks in after 2 hours. Freeze for at least another 4 hours, but ideally for 1 day. 4. Run the ice pops under hot running water for 3 seconds to unmold them. Yes, not a summer goes by that we don't make boozy ice pops, but the figs are a great touch and I haven't had a cookbook cross my desk this year that had a recipe for Negroni Fig Pops. The Weather Channel says that sometime this week, the temperature will hit 80, followed by huge rains and a plummeting thermometer! We are making ice pops so we will be ready!